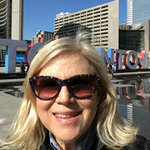 I'm the founder of On the Town Tours in Toronto. Since 2013 we've offered an eclectic menu of tours that highlight Toronto's history, architecture, and culture. 50% of Torontonians (including me) were not born here. As a non-native, I've always been driven to understand how Toronto became the city it is today. My curiousity and love of learning have led me to study our city's history, architecture and culture in a deep and serious way, and in turn share my passion for our urban fabric and its treasures with visitors and curious residents alike. Come join me!